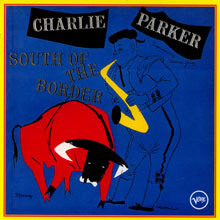 Charles Parker Jr. hailed from the jazz well that was Kansas City. Born to a teenage mother, his father had once worked in a traveling minstrel show. By all accounts he had a decent childhood despite the fact that his father was more interested in gambling than parenting. By the time he was fourteen, Charlie's father had left, leaving his doting mother to bring up Charlie, and they were living in the 'jazz district' of Kansas City. He was besotted with music and the life of the musicians he saw around 12th Street and Vine. Eventually his office-cleaner mother scraped together enough to buy Charlie a beaten-up second-hand alto sax. By the time he was sixteen, Charlie was married but playing around Kansas City wherever and whenever he could. Even then his love of improvisation drove him on, and on one occasion he tried jamming with some of Count Basie's band, but this ended in humiliation when Jo Jones, Basie's drummer, dropped his cymbal on the floor to indicate that the session was over and young Charlie was not good enough; he held a grudge against the Basie band forever more. It was around the summer of 1937 that he got a permanent job at a holiday resort in the Ozark Mountains where he at last began to master the rudiments of proper playing. The pianist with the band taught him about harmony and Charlie listened endlessly to records to dissect the solos and learn them off by heart. Having got inside the music's DNA, he was able to break free and become a brilliant improviser. Sometime around the end of 1938, Parker went to Chicago. The 65 Club, like many of the clubs, had a breakfast dance at which musicians from all over town came to hang out. According to Billy Eckstine: "A guy comes up that looks like he just got off a freight car; the raggedest guy. He asks Goon Gardner, 'Say man can I come up and blow your horn?'" Goon was more interested in a woman at the bar, so he just handed over his sax. According to Eckstine: "He blew the hell out of that thing. It was Charlie Parker, just come in from Kansas City." Parker was eighteen years old. By 1940, Parker had separated from his wife and joined pianist Jay McShann's Band, writing arrangements as well as leading the sax section. The first time that anyone outside of a club heard Charlie blow his horn was in November 1940, when the McShann Combo was heard on a Wichita radio station. Six months later, Parker was in Dallas recording with McShann for a Decca session; as well as playing alto, Charlie arranged 'Hootie Blues'. In November 1941, the McShann Quartet recorded more sides and it was during his time with McShann that he picked up the nickname 'Yardbird' no one can remember quite why, and before long everyone just called him 'Bird'. 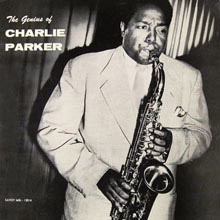 At the Savoy Ballroom in January 1942, Charlie began to get serious recognition from other musicians, especially at some after-hours sessions at Monroe's Uptown House; however, not everyone understood Parker's music. There was none of the smoothness of regular swing bands in what Charlie played; many just heard it as notes in a random order. In 1943, Parker played in Earl Hines' band along with Dizzy Gillespie; Hines recalls how conscientious they were: "They would carry exercise books with them and would go through the books in the dressing rooms when we played theaters." It was with Hines that Parker began playing the tenor sax. Necessity being the mother of invention, Budd Johnson had left Hines, and so a tenor player was required. At first Parker couldn't get used to his new sax: "Man this thing is too big." According to Charlie, he couldn't 'feel' it. Eventually the Hines band broke up and Parker played with both Andy Kirk and Noble Sissle's bands for brief spells, before moving to Chicago where Billy Eckstine recruited him for his band. It didn't last long and by late 1944 Bird was on his own, although he spent most of his time playing with Dizzy Gillespie in 52nd Street clubs; recording was impossible as there was a Musician's Union ban on making records that lasted until September 1944. It was around this time that Parker first met Miles Davis; it was an uneasy, though very fruitful relationship, and along with Dizzy these men created what we now know as be-bop. By 1945, Parker and Gillespie's band were much in demand and in early 1946 they toured California, but Bird would frequently disappear when they had gigs, which made Dizzy's on-stage life challenging. Dizzy managed the problem by taking vibraphonist Milt Jackson with them to deputize for Charlie when he went missing. As well as a six-week booking at Billy Berg's jazz club in Hollywood, they played Jazz at the Philharmonic along with Lester Young. In true fashion, Parker even arrived late for the gig at the Philharmonic Auditorium, walking on stage during a piano solo, and when Gillespie asked "Where you been? ", Parker let his sax do the talking. When the booking in Los Angeles finished, Dizzy headed back east while Parker stayed in California. Ross Russell, a hip Hollywood record shop owner and former pulp fiction writer, approached Parker with an offer of a recording contract with the label he proposed to set up. The first Dial Records session was in February 1946, and despite Charlie's heroin problems, it went well. At a session in March with a septet that included Miles Davis, Lucky Thompson and Dodo Marmarosa, Parker cut 'Yardbird Suite' and 'A Night In Tunisia'; despite Bird's drug issues, this is a pivotal moment in modern jazz. By the next session in July his supplier had been arrested, so with no heroin Parker was drinking gin by the bucket instead. Parker spent six months at Camarillo State Mental Hospital, and by February 1947 he was back in the studio sounding better than ever. He recorded 'Relaxing At Camarillo', 'Stupendous', 'Cool Blues' (with Erroll Garner on piano) and 'Bird's Nest'; these sides are arguably the cornerstones of the Parker legend. As well as sounding great, Parker was looking great, and after he finished in Los Angeles he went back to New York. Back on the East Coast, he formed a new quartet with Miles Davis, Duke Jordan, Tommy Potter and Max Roach. 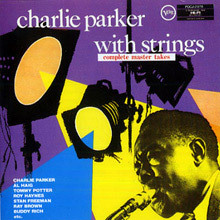 Parker lost no time in getting back into the studio and recording some more great sides in the autumn of 1947. More sessions followed, producing a string of brilliant recordings that were augmented by performances around town, including a concert at Carnegie Hall with Dizzy. At the beginning of 1949, Bird recorded for the first time for the Mercury label with Norman Granz producing, with Machito And His Orchestra. More sessions followed, and he appeared at the JATP at Carnegie Hall in February and again in September. In November he recorded with the Jimmy Carroll Orchestra for what became the quintessential Charlie Parker With Strings (1950); the album has just been remastered at Abbey Road and is available as a vinyl LP with the original cover art. The following month, a new club opened in New York; it was named Birdland in the saxophonist's honor. 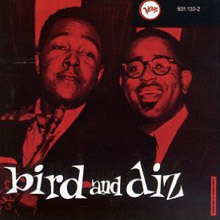 The following year, in June, he recorded - with Dizzy Gillespie, Thelonious Monk, Curly Russell on bass and Buddy Rich the sides that made up the classic recording Bird And Diz (1956). In late 1950 there was a visit to Europe, and Parker at last seemed to be getting his life under control, even if the drugs and booze were never entirely absent. Parker's band was great around this time, featuring a young John Coltrane and wowing audiences on both sides of the Atlantic. In 1950, he began living with a dancer named Chan Richardson, despite only having married his long-term girlfriend Doris two years earlier. Charlie and Chan had a daughter in 1951 and a son in 1952. Sadly Charlie's daughter died from pneumonia in 1954, an event that brought on the final decline for a man whose mind was fragile from self abuse. There were recording sessions around this time, but they were not his best, barring a few highlights; the best is Jazz at Massey Hall (1956). Things eventually got so bad that he was even banned from Birdland. By September 1954, Bird had a breakdown; he even attempted suicide. After a spell in hospital he did get back on his feet and was booked to appear at Birdland in March 1955. Before he could fulfill his engagement, he died at the home of jazz patron Baroness Pannonica de Koenigswarter, where Thelonious Monk would also pass away, nearly twenty-seven years later. Bird was thirty four when he died, but according to the autopsy report he had the body of a man of over fifty. Lived fast, died young? Definitely, but along the way he helped make modern jazz sound the way it does today. 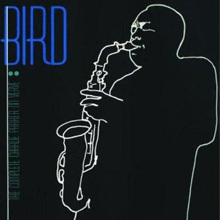 To get a total appreciation for Bird's genius check out Bird: The Complete Charlie Parker On Verve (1990) it is simply brilliant. When producer Norman Granz decided to let Charlie Parker record standards with a full string section (featuring Mitch Miller on oboe! ), the purists cried sellout, but nothing could be further from the truth. There's a real sense of involvement from Bird on these sides, which collect up all the master takes and also include some live tracks from Carnegie Hall that -- judging from the sometimes uneasy murmurings of the crowd -- amply illustrate just how weirdly this mixture of bop lines against "legit" arrangements was perceived. The music on this collection is lush, poetic, romantic as hell, and the perfect antidote to a surfeit of jazz records featuring undisciplined blowing. There's a lot of jazz, but there's only one Bird. This collection of 78 rpm singles, all recorded on June 6, 1950, was originally issued in album format in 1956. Several things distinguish this from numerous other quintet recordings featuring these two bebop pioneers. It was recorded during the period that Parker was working under the aegis of producer Norman Granz, whose preference for large and unusual ensembles was notorious. The end result in this case is a date that sounds very much like those that Parker and Gillespie recorded for Savoy and Dial, except with top-of-the-line production quality. Even more interesting, though, is Parker's choice of Thelonious Monk as pianist. Unfortunately, Monk is buried in the mix and gets very little solo space, so his highly idiosyncratic genius doesn't get much exposure here. Still, this is an outstanding album -- there are fine versions of Parker standards like "Leap Frog," "Mohawk," and "Relaxin' with Lee," as well as a burning performance of "Bloomdido" and an interesting (if not entirely thrilling) rendition of the chestnut "My Melancholy Baby." 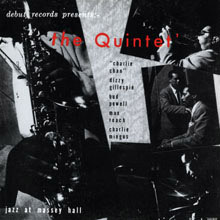 This concert was held at Massey Hall in Toronto, Canada on May 15, 1953, and was recorded by bassist Charles Mingus, who overdubbed some additional bass parts and issued it on his own Debut label as the Quintet's Jazz at Massey Hall. Charlie Parker (listed on the original album sleeve as "Charlie Chan") performed on a plastic alto, pianist Bud Powell was stone drunk from the opening bell, and Dizzy Gillespie kept popping offstage to check on the status of the first Rocky Marciano-Jersey Joe Walcott heavyweight championship bout. Subsequent editions of this evening were released as a double-live album (featuring Bud Powell's magnificent piano trio set with Mingus and Roach), dubbed The Greatest Jazz Concert Ever. The hyperbole is well-deserved, because at the time of this concert, each musician on Jazz at Massey Hall was considered to be the principle instrumental innovator within the bebop movement. All of these musicians were influenced by Charlie Parker, and their collective rapport is magical. As a result, their fervent solos on the uptempo tunes ("Salt Peanuts" and "Wee") seem to flow like one uninterrupted idea. "All the Things You Are" redefines Jerome Kern's classic ballad, with frequent echoes of "Grand Canyon Suite" from Bird and Diz, and a ruminative solo by Powell. And on Gillespie's classic "Night in Tunisia," the incomparable swagger of Bird's opening break is matched by the keening emotional intensity of Gillespie's daredevil flight. A legendary set, no matter how or when or where it's issued. Bird takes Porter's songs and extends them to glorious heights. A fine reissue. Jam Session was compiled from a 1952 jam session which brought together three of history's greatest alto saxophonists; Parker, Johnny Hodges and Benny Carter, as well as Ben Webster and Flip Phillips on tenor sax. Orchestrated by Norman Granz to come as close to an authentic jam session as possible, this is the first of the Jazz at the Philharmonic series. 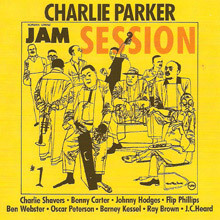 The album includes an original blues tune ("Jam Blues"), a medley of ballads selected by each musician, and a mellow blues tune called "Funky Blues." 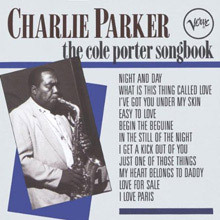 The standard "What is This Thing Called Love," stands out particularly for its follow-the-leader style ending, with each musician trading fours. Interestingly, the meeting of these three greats, with their widely varying styles, results not in spectacular and fiercely competitive playing, but rather in a slight muting and sense of reserve from all three. For those who haven't yet invested in Definitive's excellent four-CD set Charlie Parker: The Complete Norman Granz Master Takes, Verve Jazz Masters 15 may serve as a useful sampler containing some of this master improviser's best performances recorded between January 1946 and July 1953. In addition to Jazz at the Philharmonic jams ("I Can't Get Started" clocks in at over nine minutes), collaborations with orchestras led by Machito, Joe Lippman, Jimmy Carroll, and Neal Hefti, Bird is heard in the company of the best modern jazzmen of the day. By virtue of the excellent material compiled herein, this potent package rates as one of the best entries in Verve's Jazz Masters series. Verve gathers together all of the master takes of Charlie Parker's recordings with the swinging band of Afro-Cuban jazz pioneer Machito, along with ten other Latinized numbers that he cut in 1951-1952. 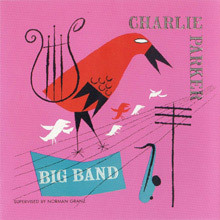 Besides illustrating the willingness of producer Norman Granz to experiment and take Parker out of a small-group bebop straitjacket, this CD shows that Bird's improvisational style changed hardly at all in a Latin setting. He continued to run off his patented lightning bop licks over the congas and bongos and they just happened to interlock with the grooves quite snugly, although he did adapt his phrasing of the tunes themselves to suit their rhythmic lines. Included here is the spectacular "No Noise" that he cut as a guest with Machito and tenorman Flip Phillips in 1948, as well as Chico O'Farrill's epic Afro-Cuban Jazz Suite (also with Machito). 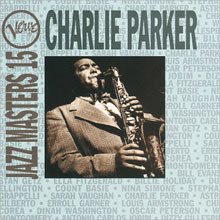 For those who do not have the ten-CD The Complete Charlie Parker on Verve -- where all 14 selections can be found -- this is an inexpensive way to hear Parker in a refreshingly different context very nearly at the top of his form. A reissue of the original 1952 Clef recording session, this is one of the few instances in Charlie Parker's later career where he played with something other than a small bebop group. Under contract at the time to Clef's Norman Granz, Parker was encouraged by the label to make recordings that took him out of his familiar settings and put him in with string arrangements, Latin rhythms, and larger band formats. This recording is the result of one of these experiments. Though Joe Lipman's arrangements are stellar, the musicians assembled for the sessions are an odd mix of pop-oriented big-band players and improvisers. The album also suffers from the pop orientation of the songs themselves: solos are kept short, and songs limited to a three-minute length that was both radio-friendly and compatible with the 78-rpm format. But when Parker does solo, it is just as magical as any of his earlier recordings. The songs also have a sweet smoothness to them that makes them eminently enjoyable. This record is not perfect, but it still musters up moments of brilliance. The reissue is even more fascinating than the original, containing 10 bonus tracks which are alternative takes of the top singles on the album. This special edition of The Genius of Charlie Parker was released in commemoration of the alto saxophonist's stint with the Savoy and Dial labels in the '40s, some 60 years prior. The studio sessions were issued under Parker's name with the exceptions of the Tiny Grimes Quintette ("Tiny's Tempo," 1944), the Dizzy Gillespie All Star Quintet ("Shaw 'Nuff," 1945), and the Miles Davis All Stars ("Sippin' at Bell's," 1947). While the studio sessions are marked by jaw-dropping ensemble interplay, the radio broadcasts, taken from live dates at the Royal Roost in New York in 1948 and 1949, show off distinctive, spontaneous brilliance, not only from Bird but from his cohorts as well. While the live broadcast recordings are a bit muddy, the state-of-the-art transfers from acetates and tape masters do brighten up these recommended, early bop sessions.